Best coffee mashines > Coffee blog > Troubleshooting > What to do if your Mr.Coffee sopped working? 1 What if Mr.Coffee Café Barista stopped working? 1.1 1. While brewing process coffee does not come out the machine. 1.2 2. Coffee comes out around the edge of the portafilter. 1.4 4. Foam and milk don’t come out the frothing tube. 1.5 5. Coffee comes out your Mr.Coffee too quickly. 1.6 6. What to do if coffee comes to weak? 1.7 7. Three lights on the control panel flash alternatively, what happens? 1.8 8. Milk reservoir lights are not illuminated, there is no frothing. 1.9 9. Water does not come out the water tank. What if Mr.Coffee Café Barista stopped working? First of all, let us mention that we will speak about BVMC and ECMPT series. These coffee machines have common problems and very close solvation methods. Let’s begin. 1. While brewing process coffee does not come out the machine. So, if your Mr.Coffee does not pour coffee into the cup, make sure you poured the water reservoir and turned on the appliance. Change the coffee grind on medium, and while preparing to brew don’t put too much coffee into the filter. Don’t press coffee too tight to prevent filter plugging. Remember, that M.Coffee can brew perfect espresso with less but not too less coffee. 2. Coffee comes out around the edge of the portafilter. It is the very common problem when your filter is not locked. But also the cause may be in the basket rim: coffee grounds around the basket edge and stops proper work of the device. So, to fix the problem, wipe off the rim and clean the filter. Then make sure you put it in the full lock position. And remember, don’t put too much coffee into the filter, don’t press it too tight. This problem may occur because of two reasons: device ran out the steam or milk is not cold enough. So, to solve it first of all make sure that there is enough water in the reservoir. Fill it if it’s empty. Then chill the milk. Mind that milk should be cold and whole (not boiled). The warm or hot liquid can be hardly frothed. 4. Foam and milk don’t come out the frothing tube. wash and rinse the parts of the reservoir. 5. Coffee comes out your Mr.Coffee too quickly. The problem may occur because you use too coarse grind coffee.Try the finer one. Also, it can happen because of less coffee in the portafilter. Fill the filter properly for better taste. 6. What to do if coffee comes to weak? If you feel that espresso from your Mr.Coffee Cafe Barista is too weak, then check the filter. It’s possible that you use the small filter for the double shot of coffee. Also, check the coffee grind: coarse grinding makes weaker coffee. To get stronger espresso use the finer grind, but not too fine to prevent the filter blocking. 7. Three lights on the control panel flash alternatively, what happens? If this happens ― check the water tank. There is a high possibility that reservoir runs out the water. Pour the water in it, and everything will stay all right. 8. Milk reservoir lights are not illuminated, there is no frothing. To fix the problem check milk reservoir: it’s either not inserted or not inserted fully. So, insert milk tank if it’s not inserted. If it’s inserted push it firmly until the lights on the control panel are illuminated. 9. Water does not come out the water tank. Possible causes for this problem may be in the not removed red plug from the reservoir base or in the water tank that was not inserted correctly. To solve the problem just remove the red plug from the water reservoir base. Mind that red plug is located in the where the water tank attaches to its base. If the red unit is removed and water still is not being pulled in, check if the reservoir is placed correctly. It must help. 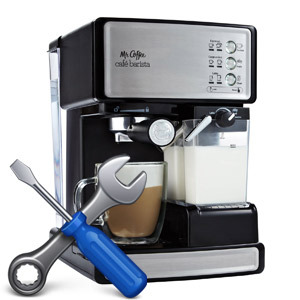 Here we gave you several tips how to fix most common problems that may occur with you Mr.Coffee Cafe Barista espresso machine. If these tips didn’t help you to find any salvation don’t try to fix or repair your appliance by yourselves. It may cause more damage. Call or try to find official Mr.Coffee service center and bring the device there. Mr.Coffee gives one-year limited guaranty on each its product and device. So, you can find a help and fix espresso machine for free.